For the truth is, whichever way we turn, we are living in a war zone. OurBible reading this morning explains why. God insists there is another war, a far more insidious, destructive war than any you will read about in the Sunday newspapers, a war which engulfs the whole world. A war with cosmic as well as eternal consequences. And rather than flee to somewhere safe, God insists we have been called up to fight. We usually associate the word jihad with Islamic extremism. Jihad is translated in English as “Holy War”. It literally means “struggle”. In the New Testament, the language of conflict and warfareis used to describe the struggle Christians face in living the holy life as God intends. It is vital therefore we remember, we are living in a war zone. How we think, how we act, how we live, will, humanly speaking, influence our part in this war and humanly speaking, the destiny of others. 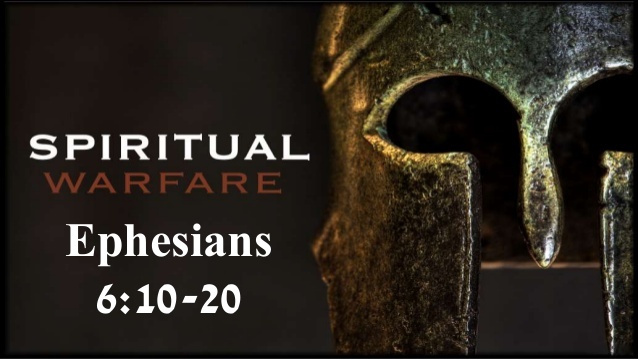 Lets look at Ephesians – chapter 6. I want us to discover, the enemy God tolerates (6:11-12); the armour God provides (6:13-20); the victory God assures (6:13). The first step in warfare is to know your enemy. Satan’s strategy is to deceive us into thinking that other people, people with different coloured skin, people speaking strange languages, people with different customs or religions or political systems, are the enemy. That’s the devil’s strategy. When we demonise other people we make a tactical mistake. Muslims are not the enemy. Communists are not the enemy. Or before them, the Germans, or before them the Irish, the Scots, the French or even our beloved Colonies who wanted their independence. The jihad or struggle we face is internal not external. It is personal and not political. At a personal level, jihad for the Christian, is a struggle against temptation and sin. At a political level, it is a struggle against evil and demonic power. What is significant, however, is that in the Scriptures the ‘enemy’ is never identified as other people, but instead with evil forces at work in the world. Those who justify violence, just as much as those who oppose the gospel, are pawns of Satan. However they may treat us, we must remember they too are created in the image and likeness of God, for whom Christ died. These verses emphasize that evil is spiritual in nature and heavenly in source, supernatural, evil and demonic.We have been called to serve the Lord in a war zone, to live in occupied territory. That is why we need to understand our purposes, live them and share them with others. That is our mission. Therefore put on the full armour of God…Stand firm then, with the belt of truth buckled around your waist, with the breastplate of righteousness in place, and with your feet fitted with the readiness that comes from the gospel of peace. It is important to emphasize that the scriptures insist that the Christian jihad is winnable. Satan can be resisted in the strength of God. The Christian jihad, therefore, is not primarily directed against other people, but against the one who abuses, incites or possesses them. The Christian jihad then must be directed at our real enemy, the devil and his spiritual forces, who oppose Jesus the Christ and persecutes his Church. How did the Roman army conquer most of Europe, North Africa and the Middle East? Superior weaponry? Stronger armour? No. They fought in legions of about 3,000 soldiers. They succeeded because they fought as one man with rigid discipline and mechanical precision. That is the only way we can withstand the evil one as well. Together. That is why our fellowship together on Sundays and mid-week home groups are so vital if we are to stand against the evil one. Each part of the armour – the belt of truth – the breastplate of righteousness – the gospel of peace – the shield of faith – the helmet of salvation – the sword of the spirit – each of these pieces of God’s armour were personified in Jesus Christ. Think about it. He is our truth, He is our righteousness, He is our peace, He is our faith, He is our salvation, He is our Word of God. God’s will is that we become like Jesus Christ. Putting the armour on is what discipleship is all about. The tide of war turned first in the hearts of those who resolved to stand their ground. Those who were willing to sacrifice their lives for a just and noble cause that would outlast them. God has privileged us to play a part in making these days memorable in the history of our world. The battle against Satan has been won, the victory is assured. But we must endure what the New Testament describes as “the Last Days” – the days between D-Day and VE Day. We must hold the line until Jesus returns and Satan is finally destroyed. In our reading from Ephesians, we’ve considered our mission in life. We have discovered the enemy God tolerates; the armour God provides and the victory God assures. While you still have breath, never, never, never give up, stand your ground, live out your purpose, complete your mission, fulfill your destiny, to the glory of God. A sermon preached at St Mary’s, Broughton and All Saints, Houghton, 26 August 2018.